With Social Signals being a major ranking factor today, (meaning having them will likely increase your ranking positions in the Google SERPs) and with people's lives becoming increasingly more hectic and busy - you don't have the time (let alone the know how) to safely and naturally build social signals to your website. Meaning your rankings tank while your competitors outrank you! Not good! And with our 15+ years experience in the SEO/SMM industry, we have created a unique service that does all the social signal building for you! Safely and naturally, building social signals to your website while you sleep! Now in this service, we will build 2500+ mixed platform social signals, shares, bookmarks, backlinks etc to your website by drip feed. If I had a time machine, I'd go back to 2005, and build a million times more Social Signals to my websites! Why? Because again and again, Social Signals have been the main contributing factor (next to my other SEO, backlinks etc) to improved rankings in the Google SERPS. Proof that Google uses them as a ranking factor. That's often why sites that have more Social Signals than others do, usually outrank them in the SERPs today. Simply put, because Social Signals are a ranking factor and having them can improve your ranking positions in the Google SERPs. More than this, they have other benefits too. Such as improved domain authority, Social Media presence and not to mention trust in people's eyes!
! But you can't just slap and go! In fact, you should say NO to start and stop SEO. And think again about your SMM! Because you need to do things properly! Especially when it comes to building social signals. You need to do them naturally, gradually, in a drip fed like process which is exactly what we do in this service. What Type of Website is Accepted and What is Not? We accept most any type of website except anything NSFW. If you're unsure, please message us about it first so we can check and verify if your website can be accepted into the system or not. How Long Does it Take to Build all the Signals? 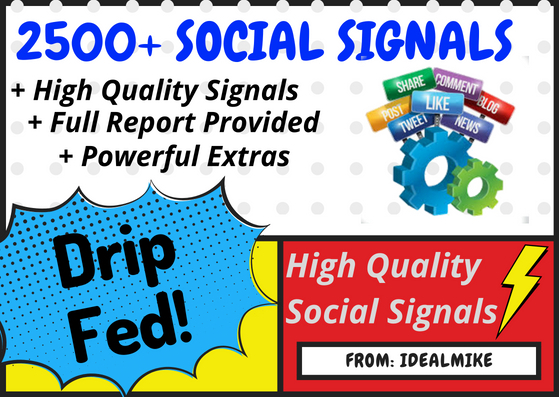 This is a drip fed social signals service and we do it all over the course of around 5 days time. We start building them within 24 hours of your order and are completed in about 5 days time. More if you order more obviously. Do You Get a Report? Yes, we will check your current signals count for the URL(s) you give us and update you with the count. And again when we are completed building all your signals so you can check for yourself. For the standard service just 1 URL per order. If you wish to use more URLs, just add it as many times for as many URLs as you want to use. NOTE: You can add it an unlimited amount of times. How Many Signals can You Build for Me? We can build an unlimited amount of signals for you. This service is for 2500 by standard, but in our extras you can get another 2500, 5000, 10000 and more plus other great extras too! If you have any more questions, please feel free to send me a message. 2500+ Super SEO Social Signals Shares Bookmarks Backlinks Powerful Google Ranking Factors is ranked 5 out of 5. Based on 40 user reviews.